That was Jana’s email response to me when I told her Sally’s answer about the hearing scheduled for the man sitting in jail for murdering our little sister Cathy. I told her the hearing would be rescheduled at a hearing on Wednesday. It’s confusing to me and to Jana with her brain racked by multiple injuries and seizures, it is simply impossible to comprehend. In age order from front to back, left to right: George Jr., Jana, Julie, Susan, Mike, Sally. This picture reminds us we once were seven. We have been preparing as a family to attend this competency hearing in Riverside, California, for many, many months. It’s been scheduled, postponed, rescheduled, postponed again and again…and again. We all have airline tickets on Southwest because, bless their hearts, they will let us change them or cancel them without penalty. We all continue to juggle our schedules and pray that we can all be there to support each other. Sally has classes to teach, Susan works in a veterinary ER clinic that needs to be staffed, Mike has the print shop to run, I am heading to the Middle East in November. I hesitate to schedule doctor or dentist appointments for me or for Jana because I am trying to keep the schedule clear so we can go. When they tell us. This time. Or the next time. The wait is long. 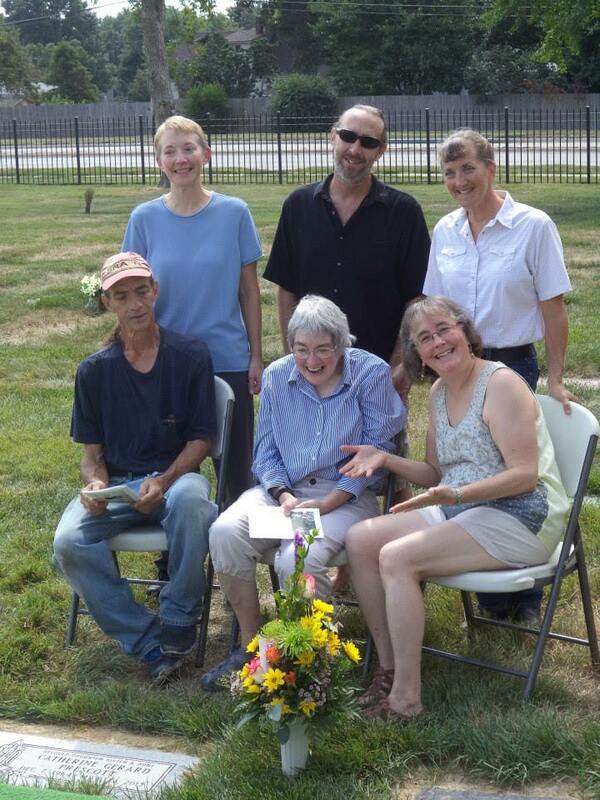 Cathy was murdered on March 24, 2013. I don’t think any of us will ever forget the date, and not just because it is there on the marker where we interred her ashes. It’s one of those things that just stays with you. 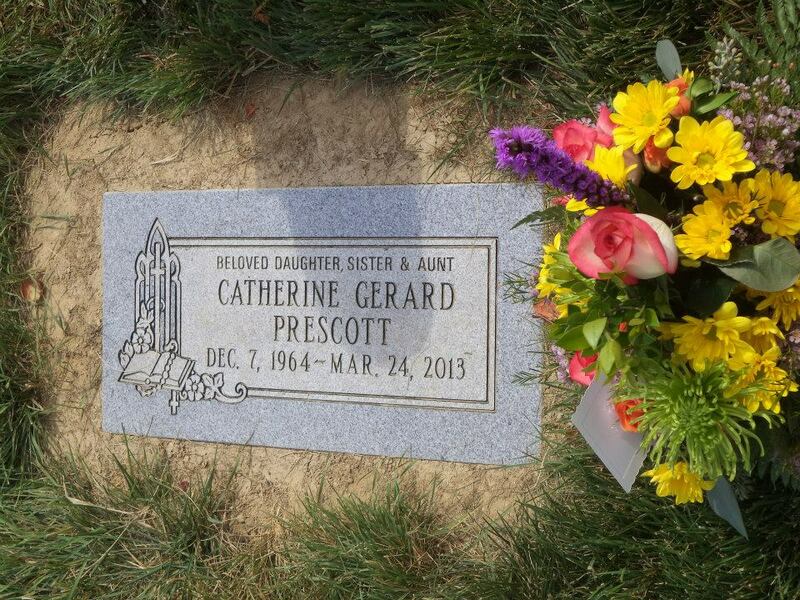 She is the only one of the seven Prescott siblings who didn’t get to celebrate the big fiftieth birthday. She was only 48. I waited for each of us to get past the 34th birthday, and one at a time we each did. That’s the one our mom never got to celebrate because ulcerative colitis took her at 33. We all made that one! And we were each breezing through the big 5-0 as well. But then the worst happened. So it has been a long wait. It’s hard to find closure when the horizon it sits on keeps moving away from us. But here’s the thing. I am grateful there is a process based in the law. There is a process that we go through to make sure we get it right. We don’t always get it right as there are people on death row right now who might be exonerated in future years because new evidence is found proving their innocence. But we don’t rely on frontier justice where we hang someone and ask questions later. We don’t parade “infidel criminals” in front of cameras and then exact justice for their alleged crimes by cutting off their heads so their families can feel the pain. Our system is better than that. And yes, our system makes us wait…and sometimes the wait is long, like it is for our family now. Precious Lord, take my hand, lead me on, help me stand. I am tired. I am weak. I am worn. Through the storm, through the night, lead me on to the light. Take my hand, precious Lord, lead me home. There can be comfort in just living the days as they come, one by one. None of this brings Cathy back to us. And though ripped from our lives as she has been, no one can rip the memories and the love we have for her out of our hearts or minds. She is our sister still and no one has changed or can change that. So we wait for justice, but not for comfort. Comfort has found us. Julie – Once again, I am so sorry for your loss. I cannot begin to comprehend it. When you speak of being grateful for the laws in our justice system that have a purpose and a process, I am reminded of the people across the world profiled by International Justice Mission which I closely follow – they endure postponements and dashed hopes constantly as a judge or lawyer simply does not show up, or a witness cannot be found. Or they are blazing a trail for justice when, heretofore, there hadn’t even been any sort of protocol. And they wait sometimes years for justice. So, I am SO glad that that is a grief you do not have to contend with. However flawed it may be, at least we have a system of justice in place. I’m glad for all of your siblings that you have places of peace to which you can retreat for solace. Your sister, Cathy, spends time in the two states where I have significant roots – Colorado and Michigan. I have wept tears of both joy and sadness at the shores of Lake Michigan and the rivers of Colorado. It is bittersweet for me to think of either of those places. Thank you for your sweet thoughts, Anne. I understand completely about IJM as well. They are working in countries where the systems are not as clear, but they are holding criminals accountable and seeking justice for victims within the constraints they find themselves. They do good work! Sometimes it doesn’t seem like our system is working, but in reality for the most part, it is. George always told me, “Trust the process.” He didn’t mean court systems, but I think it applies. Ultimately, you and I both have our trust in Jesus, and there is comfort there for me as well. Thank you for these words, Julie. Wow… A powerful testimony to hope enduring despite the situation and circumstances. Prayers for peace as each of you walks this journey together and alone… Although never alone as we have the promise “Even though I walk through the valley of the shadows, I will fear no evil because you are with me”. My heart goes out to all of you little Prescotts, but mostly to Jana. I wish she could find comfort in a garden, or at Burning Man, on a horse even a bike. Perhaps she finds it in hymns. I hope so. I think sometimes she finds it here, at the shop. Thanks Kathy. I know she finds it down at the shop, especially when you can get her to laugh. Sometimes it is a blessing to have a short term memory problem, but I think she dwells on things more than I know. I know she finds comfort in the people around her so thank you for being one of them.